The JumpStart Academy Preschool will help give your child crucial social, academic, and practical skills that will help them stay ahead of the curriculum. These lessons are not just important for preschoolers, but they will also give your child a head start and get them ready for kindergarten. 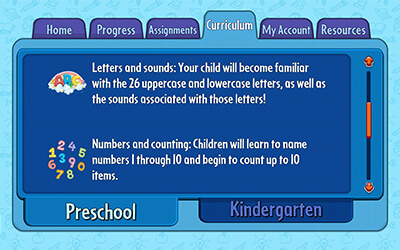 Our game is designed around the Common Core Curriculum standards to get your little learner prepared for the rest of their educational career. Through a series of interactive games and lessons, players will not only excel in the classroom, but outside as well. Your child will get an edge on their peers and will amaze teachers with the knowledge they gained from playing. With our implementation of Common Core standards and attention to real-world topics, JumpStart Academy Preschool will get them prepared to become a lifelong learner.